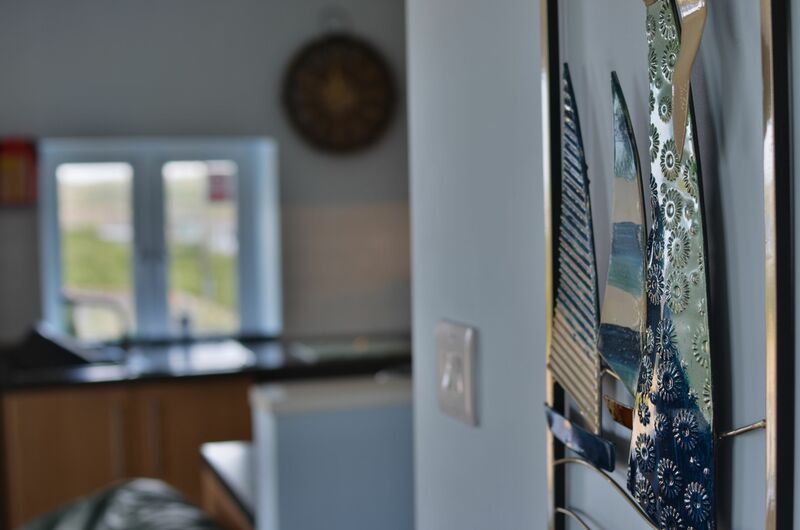 A beautifully maintained and presented property in a great spot on top of a dune with a variety of views in every direction from St Ives Bay and across West Cornwall. 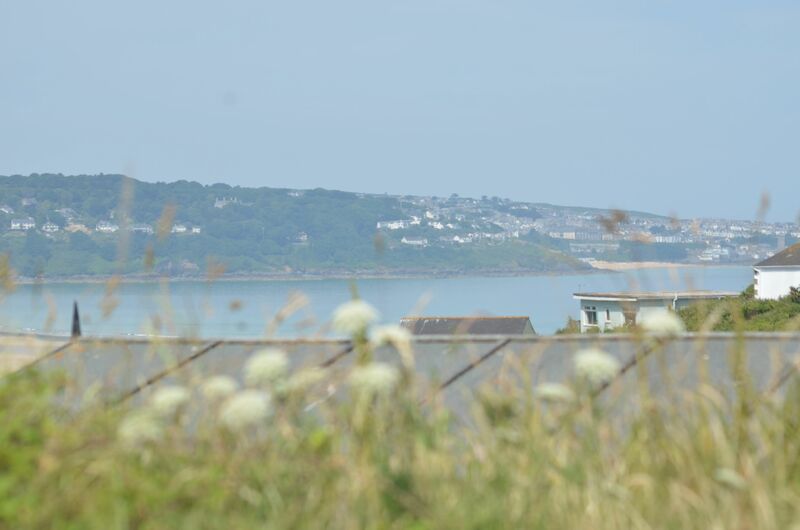 On a clear day you can even see the top of St Michaels Mount from the hill behind. Fully maintained and prepared by the local owners for your arrival. Kitchen - Fully fitted modern kitchen with a full sized fridge / freezer, washing machine and microwave. 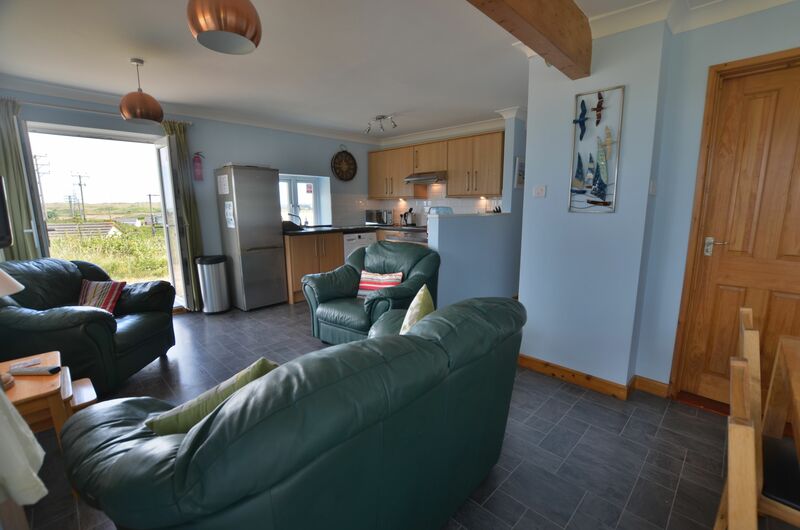 The kitchen is open plan and adjoins the living area. Views from the kitchen overlook Godrevy Lighthouse. 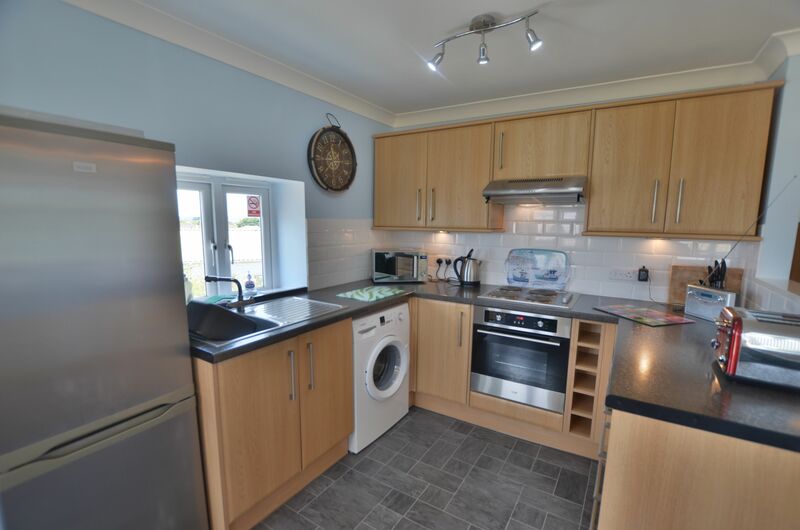 There is a full sized fan assisted cooker with four hobs and a main oven. 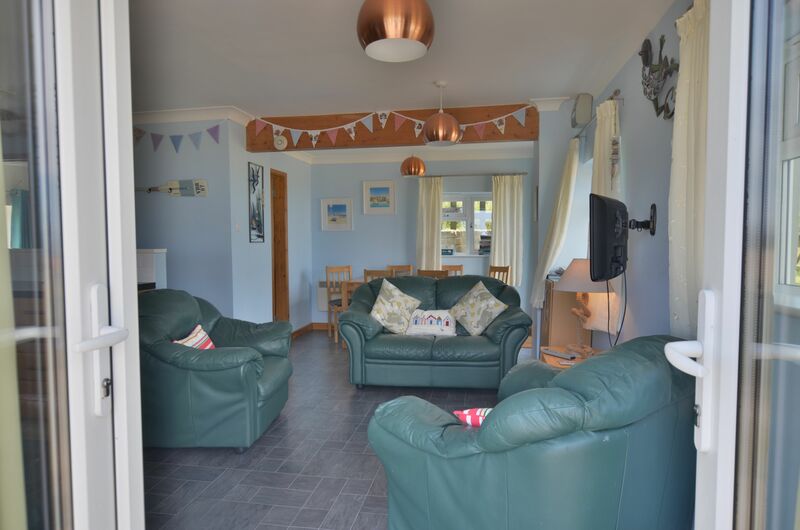 Lounge / Dining - The lounge is spacious and light due to two sets of full length doors, one set to the right hand side of the property and the other to the front of the property with views overlooking both Godrevy Lighthouse and St.Ives on the other direction. The seating area of this room benefits from a two seater sofa, two single armchairs, a wall mounted digital TV with a built in DVD player. There is also a large wooden dining table with six chairs. Patio door and French doors all lead from the open plan living area. 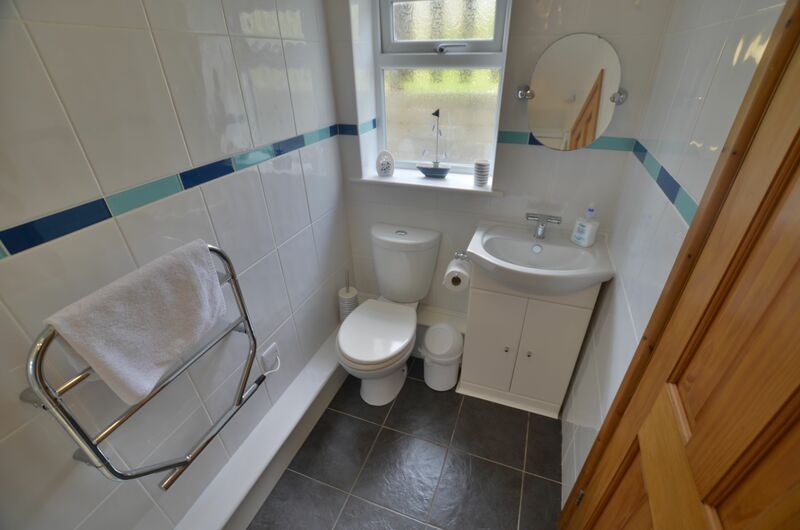 Hallway - Includes a small cupboard with ironing board, iron, mop and brush. 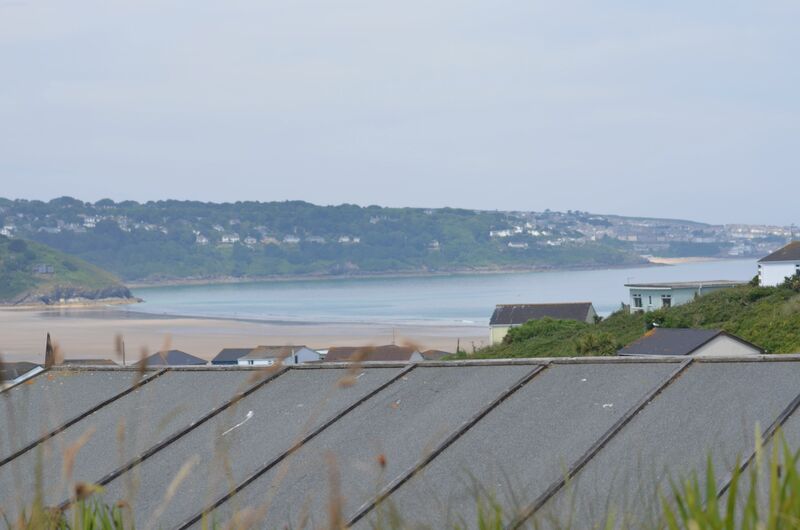 Bedroom One - Large, light and modern double bedroom, two large windows with views overlooking Hayle. Built in wardrobe, small bedside cabinet with three drawers and a bedside lamp. In this bedroom there is a wall mounted heater. the bedroom is decorated in a modern and natural style. Bedroom Two - Light, modern and spacious double bedroom with a double bed and Single bunk over the top of the double bed. Large built in wardrobe, bedside cabinet with three drawers and a lamp. Wall mounted heater. 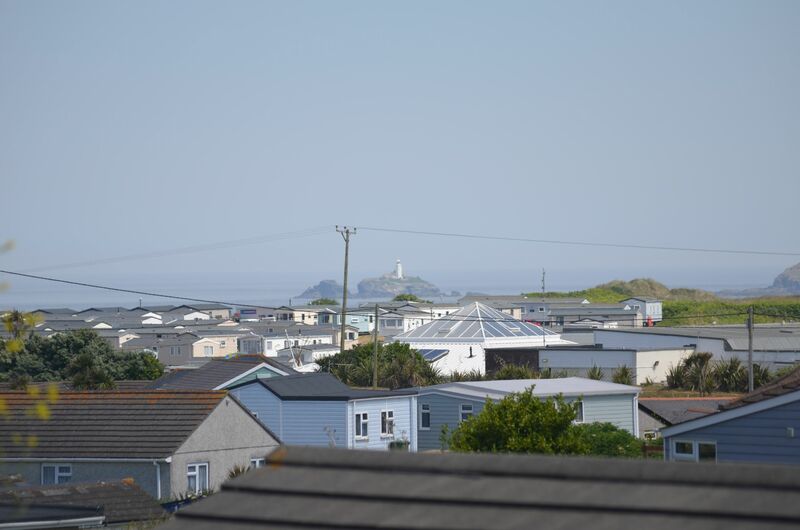 The views from this bedroom overlook the surrounding park area and Godrevy. Shower Room - Modern shower room with double shower cubicle and electric shower. toilet and basin. Outdoor bench to seat 6, with glorious views! Parking immediately beside chalet. 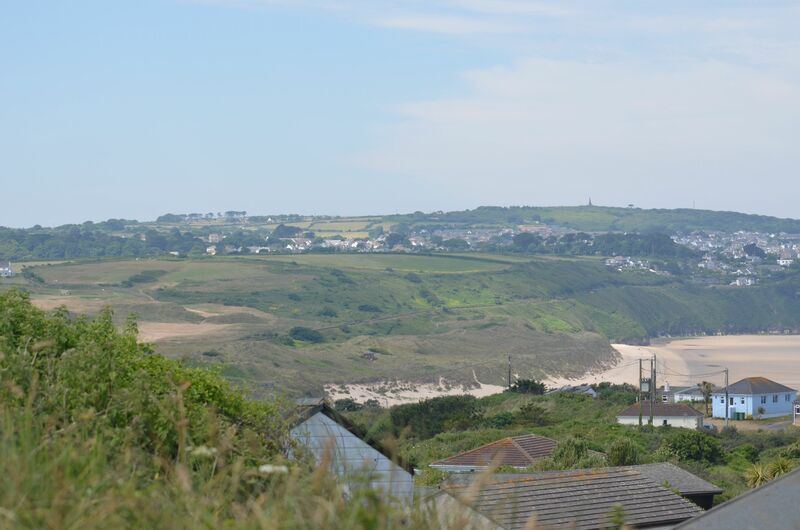 Situation- Located on Riviere Towans park which is 40 acres of unspoilt, natural, undulating sand dunes above the three mile golden sand beach at Hayle, St. Ives Bay, Cornwall. The park is one of the oldest in the country with the first chalets being here in the late 1800’s. 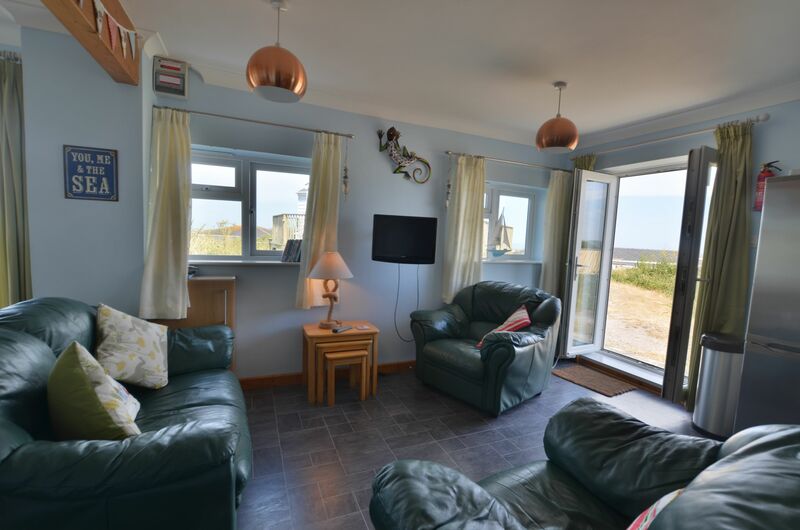 Toms Holidays at Riviere Towans is now a beautiful site with a vast range of individual privately owned accommodation including beach chalets to bungalows and lodges, many with stunning sea views and all within a few minutes’ walk of this amazing beach. The park is a tranquil setting without modern additions such as a club house to spoil the relaxed beach house atmosphere. 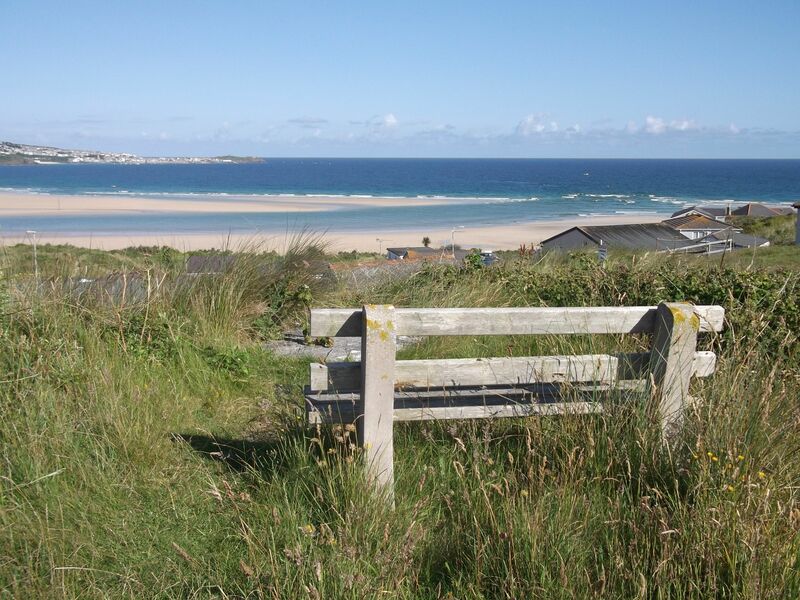 Riviere Towans is on St. Ives Bay at Hayle and within a short drive from well-known places such as St. Ives, Penzance and Lands End. Many visitors enjoy not only the beautiful beaches but the picturesque fishing villages and peaceful countryside West Cornwall has to offer. For those seeking more excitement there are great attractions and sporting opportunities close at hand. Cornwall has always been a favourite of artists, writers and film producers and its rugged coasts and beautiful coves have featured in numerous films and TV series and most recently, the popular Poldark series. 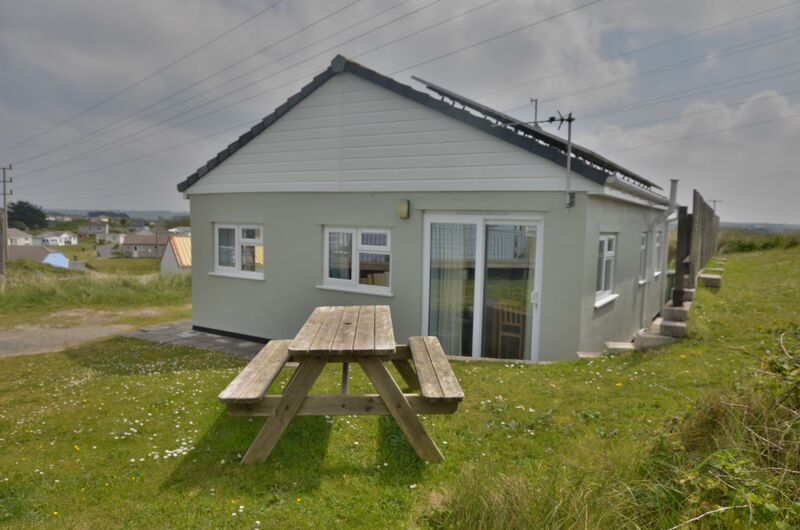 Whether it is a relaxing break or a more action packed holiday you are seeking, Toms Holidays at Riviere Towans is the ideal destination. 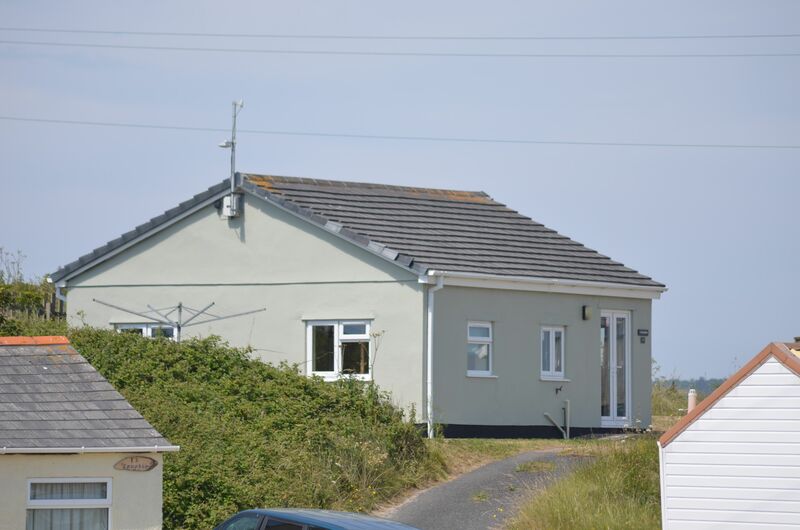 Useful information- All the properties we manage are self-contained, self-catering. All the kitchen equipment you will require for your stay is provided in the property. All properties will include a microwave, TV, iron and heating to name but a few of the basics. A large number will also include washing machines but do check the property particulars above. Linen – We provide duvets and pillows but guests are requested to bring their own bed linen and personal linen such as towels. If you are travelling from abroad or by public transport please let us know as we do carry a limited stock of linen for these situations. This allows us to provide you with the best possible price for your holiday. 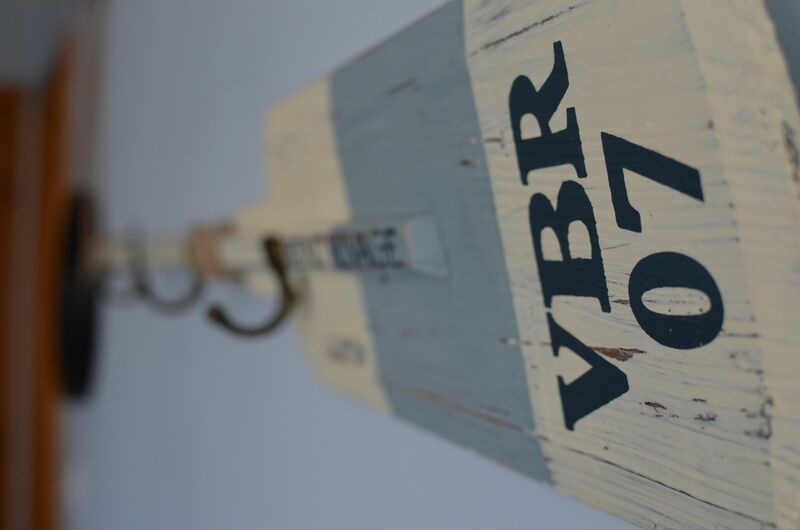 If anything is missing from a property we carry a large stock of spare items at our office which is within a couple of miles of any of the properties. Just give us a call! We loved coming back to this chalet- we stayed here back in July. An absolute home from home. We had a fantastic Ne Year here. The property is ace with a fab view! See you in May 2019! This is our first visit to Toms. What can we say, the weather was very kind to us and the accommodation is first class. Real home from home! We will be back, Thank you so much! Wonderful stay in this very comfortable and well equipped chalet, everything needed and more. Thank you so much. Oh, my life- what a wonderful week. Beautiful chalet- so well equipped. Sheer luxury- full size cooker & fridge. Marvellous! We have stayed at Toms seven times now and will defiantly be back! Thank you. A wonderful week`s stay in the beautiful chalet, a true home from home. The layout of the chalet, the number of doors and windows that we could open and let a lovely fresh sea breeze come in. We have been coming to Toms for many years and cannot believe we have never spotted his little gem until now! This is now firmly on our "to go to" list and we will be defiantly returning. Thank you. Second year returning to this property. We loved it so much last time. The view, the peace and quiet and just the general feel of the bungalow itself. We took the train from Lelant park and ride to St Ives- best train ride ever! We had a wonderful week in this property. The chalet is beautiful and just perfect for our family. The kids loved flying their kites on the beach. Thank you see you next year. Just spent a week in this lovely accommodation. Well decorated, warm, clean and comfortable. Beautiful views across the bay. All mod cons we required and instant hot water and a good shower. Will recommend to family and friends. I've had a very lovely home from home holiday. Despite the weather I have been able to catch up on my painting. Very kind of you to leave a bottle of wine. Much appreciated. Looking forward to returning again. We were impressed with the cleanliness and fresh feel of the accommodation. The view across the beach / sea was a real treat , especially when sitting oin the bench having a drink! We could not have asked for a better place to spend our week in Cornwall and would recommend this property to others. First impressions upon arrival were very good and just got better as the week went on. The attention to detail was just lovely. We went surfing every other day and looked forward to a nice hot shower and the cosy feeling oif Craigmore to come home to in the evenings. Thank you Jon & Karen for the welcome bottle, lovely touch. We have spent a lovely week in this house. Due to its good location , we were able to explore many parts of Cornwall. Thanks a lot. Lovely chalet, fantastic views. We have had a very comfortable stay. Chalet clean with everything we needed. We have had a wonderful weeks holiday staying in this beautifully presented property. We hope to return again soon to this stunning area of Cornwall. The property is well equipped and in a fantastic location. Had a fantastic 2 weeks stay. The chalet was brilliant, had everything we needed and more. Would definitely return very soon. Very nice chalet , clean and comfortable. We will recommend E39 to friends. Thank you for a lovely stay in a gorgeous chalet! Perfect location, lovely views and beautifully presented accommodation. We had a wonderful long weekend and will definitely be returning! Thank you for the wonderful time we had in your beautiful chalet. It felt like home, except with gorgeous sea view! We will definitely come back. Thank you! Thank you! We had a great stay here in this clean and beautifully presented chalet. 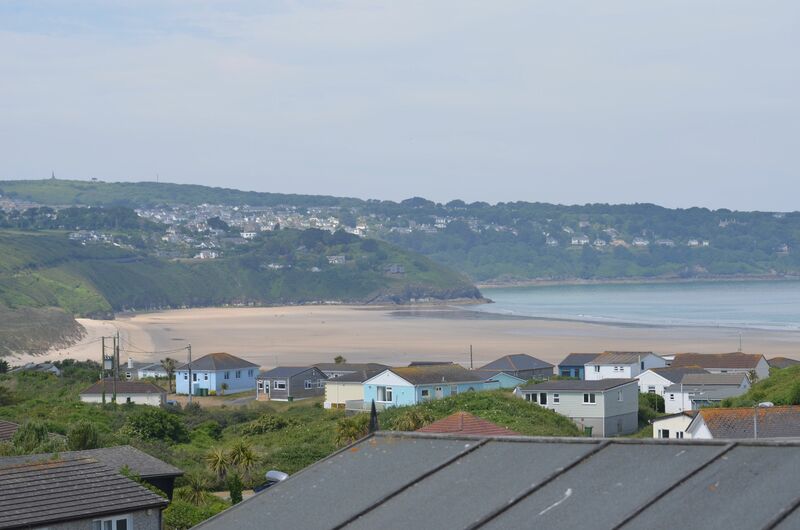 A lovely location with great views and golden sandy beach in walking distance. Everything we needed was here, a real home from home. We all had a fabulous time, will recook for next year! Lovely location, fantastic beach! We had a wonderful time staying in your beautiful holiday home, thank you! We felt completely at home with the bonus of the incredible views, wish we could stay longer! Thank you! Craigmore is absolutely idyllic. We had a beautiful stay in your gorgeous holiday home and we will definitely return soon. Had a simply wonderful "Cornish experience” this week and your beautiful Craigmore was the icing on top of the cake.